For years, we’ve been searching for the ultimate waterproof backpack (we feel it necessary to mention here that we are referring to literal waterproof-ness, and not the misleading advertising you see everywhere for backpacks and luggage that are labeled as "waterproof", but are merely weatherproof... if that!). In regard to such a backpack, we've always wanted one one that was affordable, aesthetically pleasing, and that not only excelled in the outdoor arena, but could tackle day to day life, work, photography outings, and travel. After what seemed like millennia searching for a bag that would serve us as well on the river as it did in the city, we eventually realized that what we were looking for didn’t exist. So after a year and a half of development and testing, we are proud to announce that we have created it ourselves. Introducing the Siletz Dry Bag and Modular Carry system - with 35 liters of water-tight storage and a suite of complimentary modular accessories, it is the most versatile waterproof backpack, ever. With a focus on responsibly sourced materials and conscious manufacturing, we first began with a 420D bluesign® CORDURA® Ripstop exterior, and laminated it with our completely waterproof and PVC-free Lontra™ TPU. We've utilized throughout, and 840D Hypalon graces high wear areas and lash tabs. A water tight and air tight TIZIP® grants quick and easy access to the pack’s main compartment’, and a weather proof front pocket is a perfect spot to store items needed on the go. 4-way stretch bottle pockets are positioned for an easy grab, and bottle retention straps keep your bottles locked and secured (no more losing them when you lean forward to land a fish or retie your boots!). Our articulating EVA back panel, removable waist belt and contoured shoulder straps help you carry heavy loads comfortably for hours on end - regardless of whether your navigating rapids, or an airport terminal. And a fast loading, tapered roll top closure provides an adjustable watertight seal that fastens securely on the top, so the sides are open and free to lash outdoor or photo accessories. And we didn’t stop there, to ensure that the Siletz could effortlessly adapt to nearly every aspect of your life - we designed it to work seamlessly with our two modular accessory families, the Work & Travel System, and the Outdoor System. Designed simplify the life of those who travel, fly and work on the go, the Siletz Work & Travel System has accessories dedicated to carrying everything you need to live and work out of the Siletz for a few days or more. Discretely located on the inside of the bag's back panel, low profile MOD.U.LOX® hardware allows the Siletz laptop sleeve to be snapped securely in place, and be released with the push of a button. The padded laptop compartment carries up to 15” laptops and has two exterior organizer pockets for stowing items essential to your workflow. Our padded Travel/Photo Insert offers enough space to pack for a multi day trip (to clarify, a "trip" to us entails anything and everything away from home - business, surfing, fly fishing, climbing, etc) and with the interior pockets and removable dividers it can carry either a full camera kit, or a combination of your clothes and camera gear. The Insert's stretch mesh front pocket is designed to be accessible from the bag’s external TIZIP®, so you can also grab your wallet, passport, or keys without having to unroll the top of the bag. The Night Bag offers sufficient, accessible storage with a key ring and interior dividers to organize all of your travel necessities, and it can also be securely snapped into the MOD.U.LOX® hardware if you're traveling without your laptop sleeve. On top of it all is sufficient storage left in the pack for a jacket, book, headphones, and more, so that you can carry everything you need anywhere you go, and feel confident knowing that it’s protected from the elements. The Siletz Outdoor System is any fly angler's, kayaker's, trail builder's, or field worker's best companion. Long gone are the days of rushing home, thirsty and starving after your favorite outdoor activities! 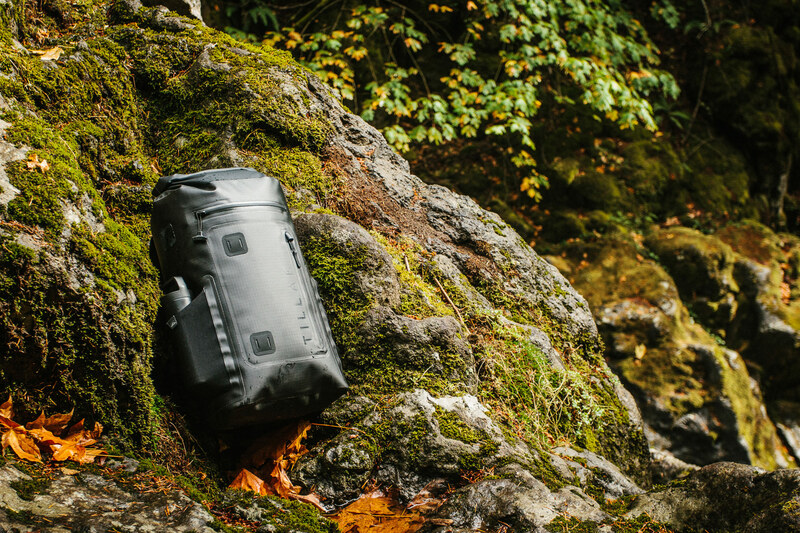 The Outdoor System's integrated Cooler insert sits flush in the bottom of the Siletz, it’s airtight TIZIP® lid providing access to up to 7 chilled bottles or cans with room for ice - and our 1” thick closed cell insulation can keep it all cold for over 48 hours. Man, we use this thing a lot - inside and outside of the bag! For those of you that go hard, the padded and ergonomic waist belt distributes heavier loads and keeps the pack stable during high exertion activities like cycling or snowboarding. And its two stretch mesh hip pockets allow quick access to small items like a phone, GPS, or chapstick. The 25L wet/dry bag insert is shaped to fit perfectly inside the Siletz and offers a clean and lightweight solution for carrying wet or dirty items in your pack. Fold it up and stow it in the front pocket when it’s not in use, and don't ever worry about standing perplexed on the bank of the river or on the beach again, wondering what the hell to do with the wet and/or dirty suit or waders you just pulled off...problem solved! The removable Shoulder Pouch has a strategic combination of sleeves, pockets and d-rings so that it can carry any gear you might need at a moment’s notice, and it attaches and detaches from the Siletz’ shoulder straps in a matter of seconds (we absolutely love this thing for fishing!). The larger Gear Pouch snaps securely into the bag with our MOD.U.LOX hardware, so that snacks or small essentials can be carried safe and snug while you’re busy having fun outside. Help Us Bring the Siletz to Life! Whether its a work trip or a weekend getaway, hauling groceries or running rapids, with the Siletz Modular Carry system you can have one bag that does it all, and with our Lifetime Guarantee you can feel confident that that one bag will last you as long as you’ll need it. So please support and share our ongoing Kickstarter campaign to help bring you the Worlds Most Versatile waterproof backpack. In line with our mission to give back, your support will help us contribute to the efforts of a notable and worthy cause. 25% of the profits generated by our Kickstarter campaign will be allocated to the Native Fish Society’s efforts to halt irresponsible timber harvest practices within the Siletz River Watershed and elsewhere.